65: I Felt Pretty Damned Proud. I hope you haven’t worried, but I told you there would be this hiatus. We were in the field for a long time–we covered many a mile on these dogs of mine–a lot of firing. We’ve been able to get more ammo on here than we ever got back in the States. It’s been a long, tiring session, but nobody minded it too much. We knew we had to get back into condition, and there were a lot of things we had to learn–mistakes we made last time and how to correct them–new angles to suit the different types of fighting we’re going to do next time. The Marine Corps is really damned good on that angle–preparation and careful planning. We rehearsed our methods and attack formulae months before we left Pendleton, though we didn’t know it then. It’s the kind of foresight that pays dividends. We had a parade yesterday, and Nimitz presented the medals and citations to the 4th Division. About 35 were awarded, and almost 90 percent of them went to the 24th Marines. No Congressional Medals were awarded, but 6 Navy Crosses were–the next highest honor. Colonel Hart got one, a company commander in the 2nd Battalion got one, and four were awarded to enlisted men–one man in “B” Company and three in A Company! Think of it! There are about 65 companies in the Division, and A Company got 3 out of the 4 awards made to enlisted men! And to top it all, two of those men were in my platoon! Ervin and Tucker. I felt pretty damned proud, I can tell you–not many Platoon leaders in the American forces can say anything like that. Sergeant Tucker, just after receiving his Navy Cross from Admiral Nimitz. Admiral Nimitz’s speech was very moving–he set just exactly the right note, and he mentioned three names, typifying those killed who we shall not forget–Stephen Hopkins, Col. Dyess, and Jack Brown, whose father was with him in the same outfit. Harry was awarded the Silver Star, and another man in the Company (Corp. Frihauf) the Bronze Star, so it was a pretty drunken night last night. Thank you, dears, for the pictures–I especially appreciated the one of you as a girl, Mother. I hope I don’t lose it out here, somehow or other. Gretch, I don’t like your hair the way it was in the picture at the office–pulled back. Have some fluff in it, like the one in the park. 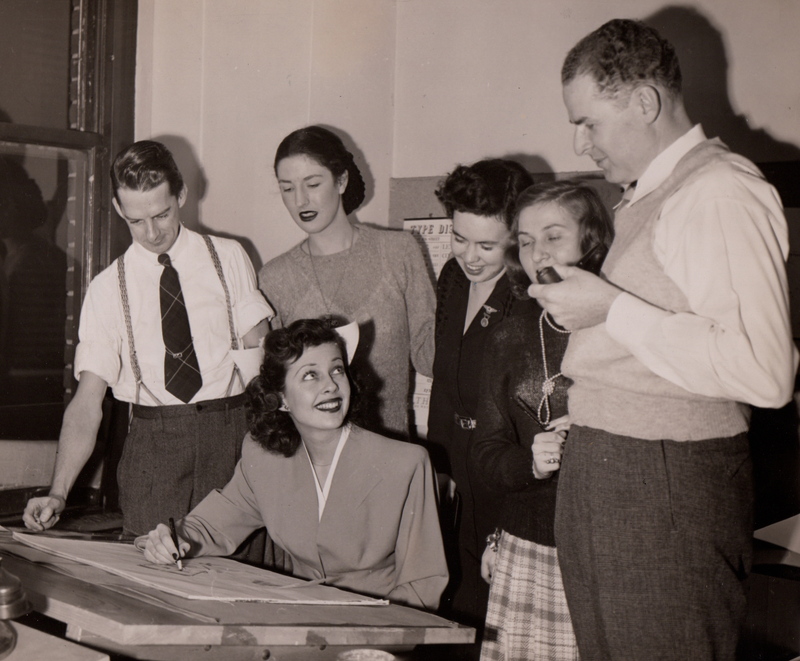 Gretchen, standing second from left. I have a good bit of money, but I won’t send it just yet. Phil counts only the awards made to men present at the ceremony. The Fourth Marine Division received four Congressional Medals of Honor; two of the recipients were hospitalized, and the other two (including Lt. Col. Dyess) were dead. 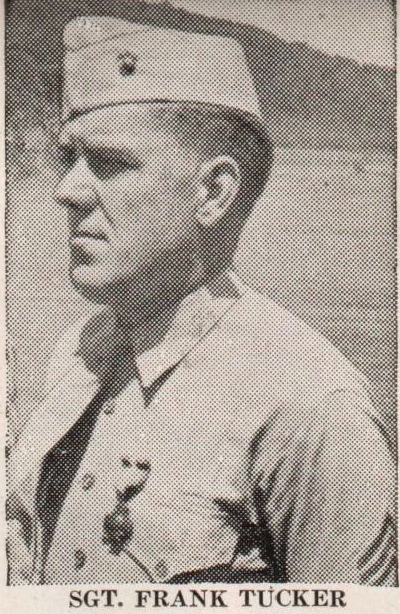 The company commander is Captain Frank E. Garretson, F/2/24. The man in B Company is Corporal Alex Haluchak. The third Navy Cross in Company A went to PFC Howard E. Smith for rescuing two Marines from a burning tank. PFC Jack H. Brown and Sergeant Earl A. Brown were both in I/3/24. Jack, hospitalized before Namur, went AWOL and stowed away aboard a transport to fight alongside his father. The nineteen-year-old PFC was killed in the Japanese banzai attack on D+2 morning; “Pop” Brown survived the war. Harry Reynolds, company executive officer, and Corporal Mike Frihauf, a squad leader. Frihauf’s name is inserted with a caret.